This year I’m teaching geography at our homeschool co-op and each week two students bring in a food report from the country we’re studying. When we studied Korea a student brought in a traditional snack called Hotteok (Hoddeok) and ya’ll, they were amazing. I made them for my family the next Saturday and they were a hit. What exactly are Korean Hotteok? 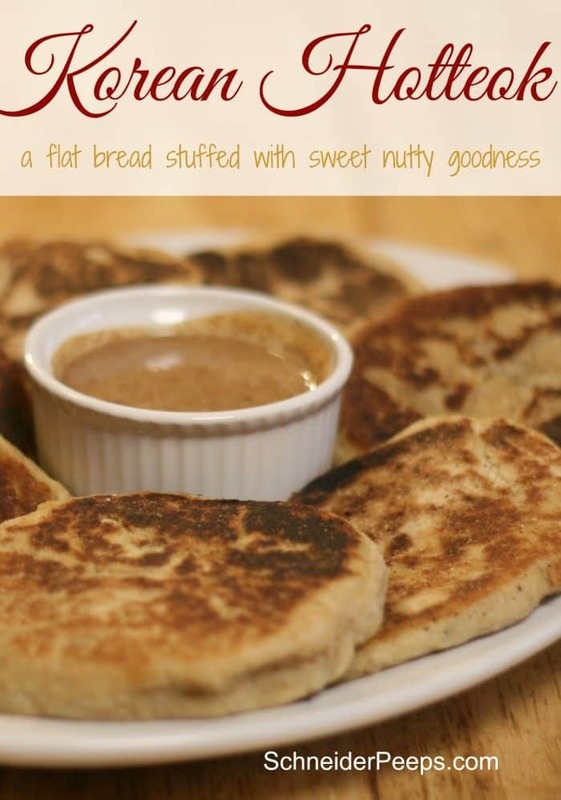 They are similar to a flat bread stuffed with brown sugar and nuts. The nice thing is that the dough can be made the night before and put in the refrigerator and then cooked the next morning – otherwise the first rise is an hour, which is fine on a leisurely day. 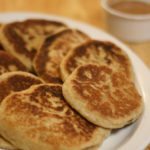 And since this week we’re sharing breakfasts for a weekend for Hot Breakfast Month, I knew I wanted to share these with you. The recipe the student brought to our geography class was from maangchi.com – she’s the real deal when it come to Korean cooking. I, on the other hand, am not but I’m a firm believer in trying new things and adapting recipes to fit the tastes of my family. 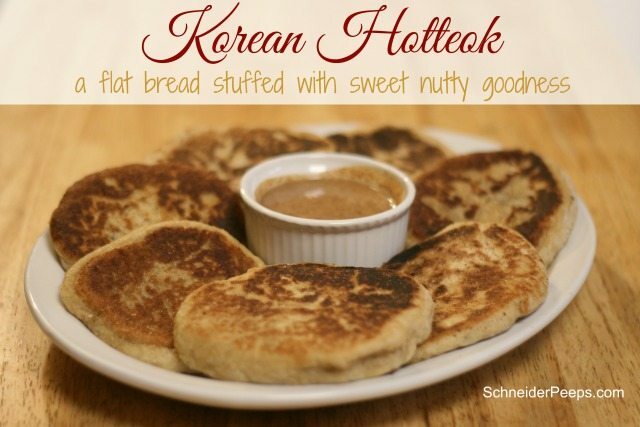 I’m sharing with you an adapted version of the traditional Korean Hotteok. I used freshly ground hard white wheat for the flour. When you make the dough know that it will be really really wet. 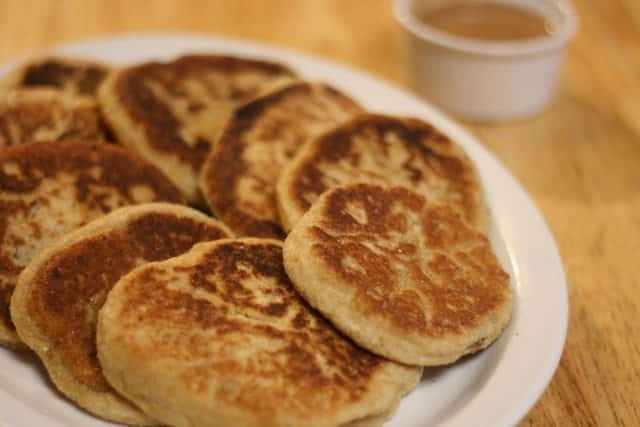 You’ll think it’s too wet and wan tot add more flour – don’t. While the dough is rising, you can make your filling. 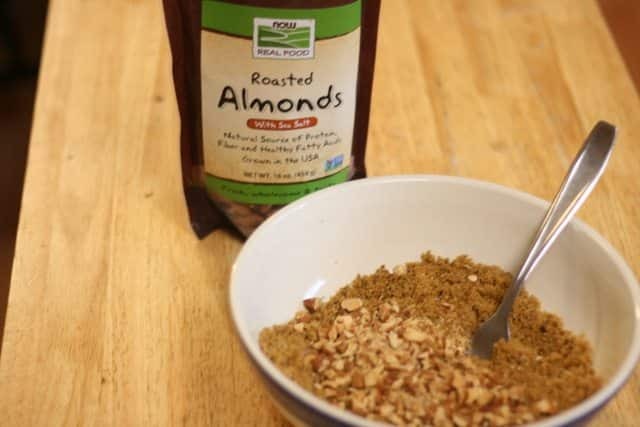 Walnuts are the traditional nut used in hotteok, I usually pecans from our trees) but Now Foods sent me some almonds for Hot Breakfast Month and I thought they would be wonderful in these. And they were. After the dough has risen you will need to use a LOT of flour to make 8 balls of dough per batch. I know it looks excessive but the dough is pretty sticky. Take a ball and put some filling on it. Then pull the sides up and pinch them shut. Fry them in just a bit of oil. 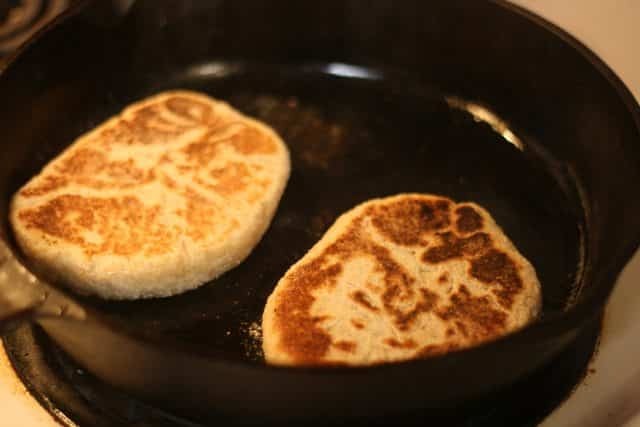 One minute or so on each side and use a spatula to flatten them down. They should look like a thick pancake. I used a lid for my pan to help the filling cook a little more and make a syrup. This is totally nontraditional, but I was inspired by Jami from An Oregon Cottage and decided to make a dipping sauce to go with our Hotteok. Not only was is really good but it added a little more protein to the meal. I used Woodstock’s almond butter, Maple Valley Co-operative’s maple syrup and Pacific Food’s almond milk. I really liked this combination and even though it was almond butter and almond milk the flavor was not overpowering – Esther especially liked the dipping sauce. These are best enjoyed hot. Since I need to make quite a few for my family, I put them in a warm oven (150°F) until we are ready to eat. Also, when I’m making them for breakfast I serve them with a side of eggs and some fruit. A delicious traditional street vendor snack from Korea and makes a wonderful weekend breakfast. In a mixing bowl, mix together warm water, yeast, salt, oil and white sugar. Add the flour and mix well (I like to use a wooden spoon for this). Put plastic wrap over the bowl and let the dough rise for an hour or until double. After an hour, punch dough down and knead it for just a bit too get rid of gas bubbles. Let it rise for 10-20 more minutes. 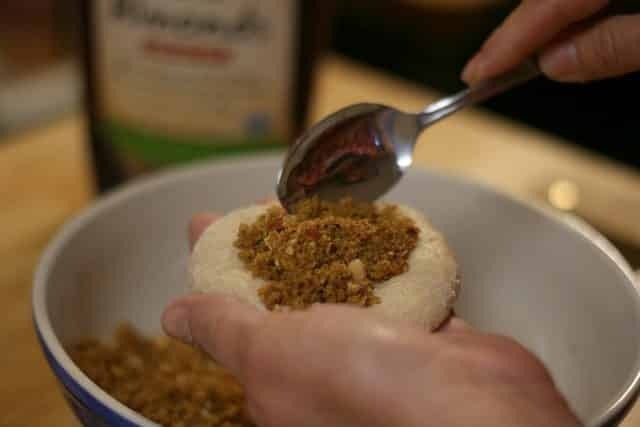 To make the filling combine brown sugar, nuts and cinnamon. 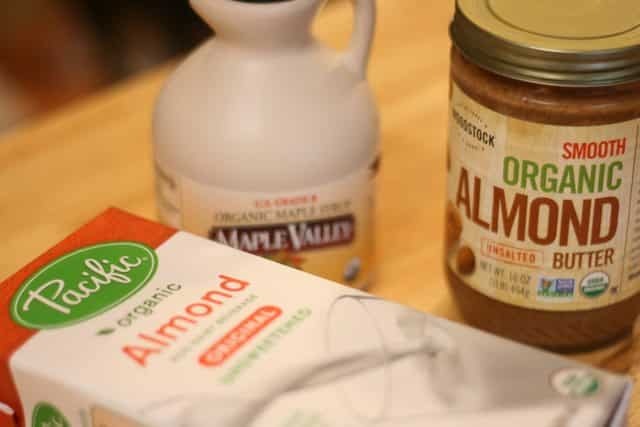 To make the glaze combine nut butter, maple syrup and milk to the desired consistency. Turn the dough out onto a well floured cutting board and knead once again to release the gas bubbles. Divide into eight same size balls. 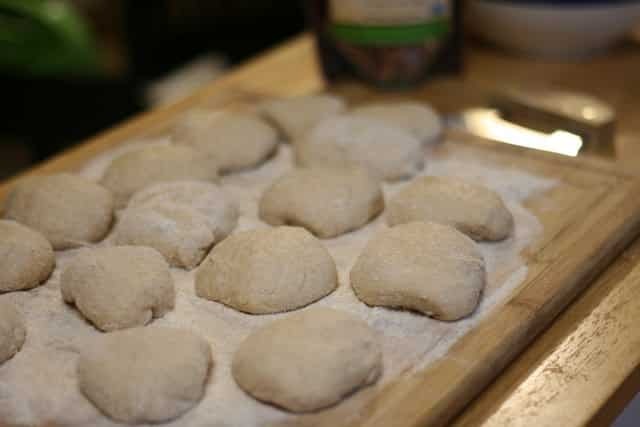 Take a dough ball and and flatten it just a bit in your hand (make sure there is plenty of flour on your hand) and put a spoonful of filling on it. Pull the edges up and pinch them together. Fry in just a bit of oil over medium heat until bottom is lightly browned. Flip it over and use a spatula to flatten it. Cook until the second side is brown. Flip it one more time, put the lid on the pan, turn the heat down and cook for another minute or two. 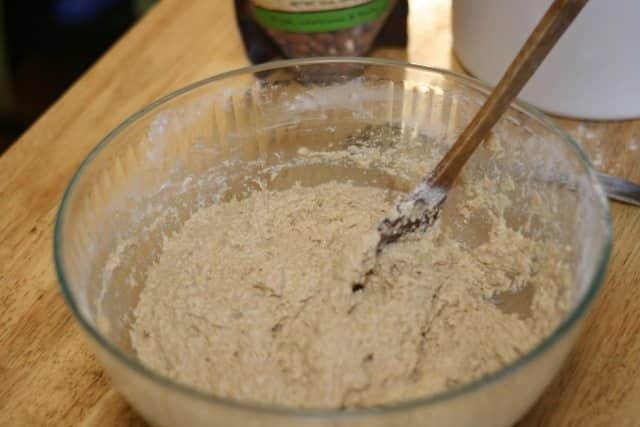 You can make the dough the night before and put in the refrigerator until morning. Just punch down the dough and do the second rise. You can stuff this anything - apples, dates, cheese and meat, whatever suits your fancy. 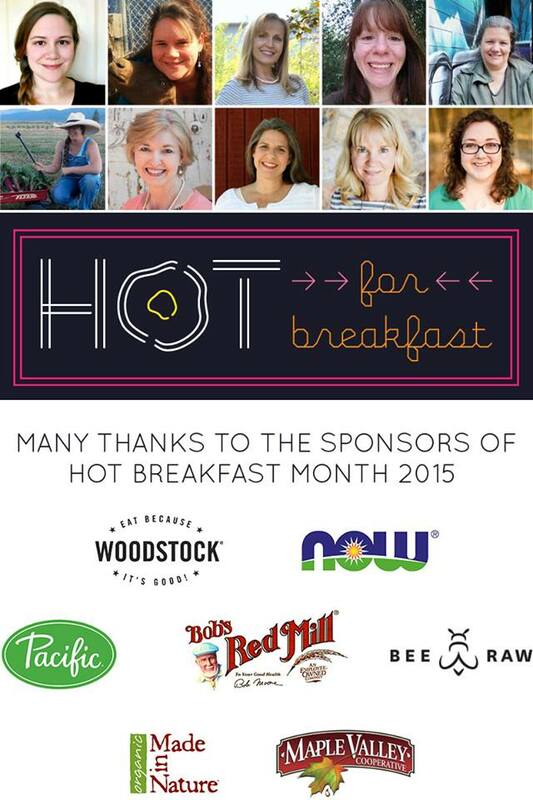 The following companies generously sponsored various #hotforbreakfast month projects. I may not have used all of them in my recipes, but this project is in no small part thanks to them and their incredible contributions: Bee Raw, Bob’s Red Mill, Made in Nature, Maple Valley Syrup Cooperative, Now Foods, Pacific Foods & Woodstock. In case you missed it, I received free products to use for my Hot Breakfast Month posts. Even though I received free products, my opinions of the products aren’t tainted by that fact. I’m excited to share with you companies that are committed to some of the same things we’re committed to and wouldn’t share them with you if I had a bad experience with them. You can learn more on our disclosure page. These look absolutely delicious! Looks like a perfect breakfast dessert, and I’m all about that! These look so yummy! My kids love to try foods from other cultures; they’re forever getting cultural cookbooks from the library. Unit studies with food are very memorable, after all. Pinning! How fun! I bet that was a great trip.